Fighter squadron two hundred and one was established at NAS Dallas on the 25th of July 1970 and has been in continuous service ever since. The Hunters were initially equipped with the F-8 Crusader, one of the most fondly remembered of all Navy fighters. In February 1976 they upgraded to the F-4N Phantom II, beginning an association with the Phantom that was to last 11 years. However not all of this time was on the F-4N, as in 1984 the squadron transitioned to the F-4S, the most advanced Phantom variant to enter Navy service. However, with the Navy moving to a policy of equipping reserve units with equipment as good as that of front line units VF-201 did not have long before the next lot of new equipment arrived. Early in 1987 VF-201 had received their first F-14A Tomcat, BuNo. 158634, and continued to receive F-14's until December that year, when the unit's last F-4S, BuNo. 155732, was flown to the bone yard at Davis Monthan AFB. Within six months of completing the transition VF-201 carrier qualified onboard the USS Forrestal (CV-59). In keeping with present policy of giving the reserves equipment of the same quality as their active counterparts, at least some of the machines VF-201 received were fresh off the assembly line. Indeed one of them (BuNo. 162711) was the last example of the F-14A produced by (Northrop) Grumman, as after this production changed to the F-14A+ (F-14B). As with fleet squadrons VF-201's role has expanded considerably in the last few years to encompass the new "Strike-Fighter" idea. Thus the squadron is now capable of dropping unguided bombs, cluster munitions, TALD decoys, air laid mines, GBU-10/12/16 series LGB's, practice bombs and marker flares. This capability has been proven in exercises such as the deployment the squadron undertook to NAS Fallon in 1995 as part of training for the whole of the reserve air wing (CVWR-20). Another new role the squadron has picked up in the last few years is the TARPS mission. This was originally carried out by VF-202 "Superheats", however when the time came for one of CVWR-20's two F- 14 squadrons to disestablish the circumstances dictated that VF-201 survived (VF-202's birds were nearer the end of their airframe lives and so would have required either replacement or overhaul). Another first for VF-201 was it's participation in a mine readiness inspection in October 1994, which it passed with flying colours. Due to cutbacks in active fleet aggressor squadrons VF-201 has picked up the adversary mission as well, providing a range of adversary profiles, from "simple" 1v1 training for less experienced F-14 crews to full furball encounters using simulated missiles and kills. This provides realistic training for whole air wings and enables them to conduct realistic composite strike force attacks against a well trained and equipped aggressor force. The squadron, along with the rest of CVWR-20, is nominally assigned to the USS John F. Kennedy (CV-67) which is now designated as the reserve carrier. Operational circumstances dictated that VF-201 were unable to perform their summer 1996 training detachment upon "their" carrier, instead gaining an opportunity to fly from the Navy's newest operational carrier, the USS John C. Stennis (CVN-74). This was the first time that the whole wing has been assembled together in 7 years. The deployment also featured an opportunity for live weapons firing, with most squadrons using up the majority of their annual live weapon allowance. VF-201 fired 7 AIM-9's, 6 AIM-7's and 1 AIM-54, two more AIM-54's were due to be fired, but due to technical difficulties with the missiles were not used. Showing just how big a part of the F-14's role air-to-ground missions have become, VF-201 also dropped 17,000lbs of ordnance. The other squadrons that participated in the carrier training were VFA-203 Blue Dolphins, flying the F/A-18A, VFA-204 River Rattlers, also with the F/A-18A, VAQ-209 Star Warriors, flying the EA-6B, VAW-78 Fighting Escargots, with the E-2C, and HS-75 flying the SH-60F. Also aboard was the active Navy unit VS-32 Maulers, flying the S-3B, as CVWR-20 has no S-3 unit assigned to it. VFC-12, flying a single F/A-18B Hornet also participated, this bird carrying the CAG, Captain Charles Askey and allowing him to complete his Carrier Qualification (CQ). In July 1996 VF-201 deployed to the Naval Air Station at Key West, Florida, to provide dissimilar air training for the active F/A-18 squadron VFA-106 Gladiators, the East coast Hornet training squadron. This was probably a very popular detachment, for as well as providing plenty of ACM flights, it would of allowed the crews to enjoy the fine Florida weather, whenever they could catch a break that is! When VF-201 deployed several jets to NAS Oceana in late August/early September 1996 the 2 unused AIM-54's were finally fired, despite the best efforts of two hurricanes to interfere. The visit to NAS Oceana, as well as providing an opportunity to shoot the AIM-54's, enabled VF-201 to participate in the SFARP (Strike Fighter Air Readiness Program) course. Late 1996 saw VF-201 conducting local operations out of NAS Dallas, preparing for the forthcoming inspection by CVWR-20 command staff. The flurry of activity in and around Iraq did not lead to VF-201 being activated, but the unit was put on stand by, meaning it had to put as many jets as possible in combat configuration. With the F-14 not being the newest of designs getting all 15 ready in such a short space of time was a commendable effort. In November 1996 VF-201 deployed six F-14's to NAS Fallon, where they provided Dissimilar Air Combat Training (DACT) for CVW-2. This provided excellant training for both VF-201 and CVW-2, especially VF-2, whose F-14D's gave them an edge over VF-201's F-14A's and VFC-13's F-5E/F's. As the only reserve F-14 squadron remaining (the whole of CVWR-30 being disestablished) VF-201 has a busy schedule, especially as the force draw down means that the reserves now play a more active role and are much more likely to be called upon in times of conflict. VF-201 has risen to this call admirably. VF-201 has not rested on it's laurels for the last few years, continuing it's tradition of excellence by winning the 1993 Battle "E" award and the 1994 Chief of Naval Operations (CNO) safety "S" award. With all Pacific F-14 squadrons moving to NAS Oceana it might be assumed that VF-201 would have moved there as well, however this was not the case. Instead during November 1996 the squadron moved to NAS Ft.Worth, a new Joint Reserve Base (JRB) along the lines of the recently reorgansied NAS New Orleans. After a celebratory flyby featuring all 14 F-14's VF-201 suspended flying from NAS Dallas on the 25th of November 1996 and began the process of transferring all their aircraft and equipment to the new base. Flying operations restarted from the new base in mid December. The other squadrons operating out of NAS Ft.Worth (coincidentally, just opposite the facility where Lockheed Martin build the F-16) represent the other three branches of the US armed services, making NAS Ft.Worth a truly Joint base. The squadrons are are VR-59 (flying the C-9B), VMGR-234 (flying the KC-130F/T), VMFA-112 (flying the F/A-18A), the 475th FS of the 301st FW (with the F-16C), the 181st AS of the 136th AW, Texan ANG (flying the C-130H) and the 148th Aviation Battalion, Texan Army National Guard (flying the CH-47D). 1997 got off to a busy start for the Hunters, on three days notice they had to deploy 6 aircraft to Elmendorf AFB, Alaska for Exercise "Arctic Express 1-97". Originally this deployment had been scheduled for an active F-14 squadron, but they were unable to attend and so VF-201 filled the slot. Less than two weeks later, on the 28th of January, VF-201 took part in a scheduled deployment to NAS Fallon, Nevada. This was a live bomb drop exercise and saw the squadron drop 195,000lbs of ordnance and shoot 3500 rounds of 20mm cannon ammo. Also at Fallon during this period were VF-102 "Diamondbacks" flying their brand new updated F-14B's. This version has LANTIRN capability and other upgrades to keep the F-14 curent with the expected threats. However some flight tests were still to be completed, so that at this point VF-102 were only able to carry practice bombs on triple ejector racks, rather than "live" ordnance. Early March has seen the majority of VF-201 deploy to NAS Key West, Florida, for a two week detatchment to provide ACM training to new F-14 crews from VF-101. Just a few days earlier, on the 9th of March, aircraft 116 had to make a wire arrested landing at Ft. Worth due to an engine stalling while in an ACM engagement with F-5E's from VFC-13. 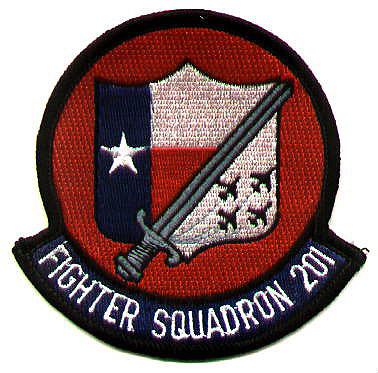 Markings for VF-201 are fairly low key, with a silhouette of the Texan state in black, this then having the air wing code 'AF' superimposed on it. Four black lines stretch diagonally from the front base of the tail to the rear top. These may represent the four aircraft that are to be found on the squadron insignia (which also features a sword against the backdrop of a Texan flag). An image of their CAG bird from the mid 80's/early 90's is below, the only change since then has been the deletion of the buff coloured nose radome. Aircraft marked with a * are the aircraft that are wired to take the TARPS reconnaissance system. All of VF-201's aircraft are Block 140 standard F-14A's, the latest standard. As of the 9th of March 1997, F-14 BuNo. 161152 had the highest number of hours on the clock, having flown 4813.9 hours. Unfortunately this high total means 115 is past her expected airframe life and so is presently awaiting a "strike" decision to remove her from the Naval inventory. Her high airframe life is unusual because the BuNo. indicates that 115 is the newest aircraft the squadron has, however, much of this is due to the fact that a large proportion of this aircraft's life was spent with VF-101, who use their Tomcat's much more than fleet units. Aircraft at the Grumman St. Augestine Facility are undergoing upgrade, presumably as part of the F-14A/B Block Upgrade, which will give them LANTIRN capability, new cockpit displays, GPS navigation systems and a radar and fire control system upgrade. VF-201 is due to receive four LANTIRN pods during FY97 in replacement for the 4 they were due to receive during FY96. These pods were instead diverted to VF-103, to enable them to work up to full LANTIRN capability in a short space of time. Once the pods and upgraded F-14A's are received VF-201 air and ground crew will begin schooling upon how to load, fly and fight with LGB's, day or night.